This species is accepted, and its native range is Temp. Eurasia, NW. Africa. Perennial; caespitose. Rootstock evident. Culms erect, or geniculately ascending; 40-80 cm long. Leaves mostly basal. Ligule a ciliolate membrane. Leaf-blades 3-15 cm long; 2-4 mm wide; glaucous. Leaf-blade surface scaberulous. Leaf-blade margins tuberculate-ciliate; hairy at base. Inflorescence composed of racemes. Racemes 5-15; digitate; 4-6 cm long. Rhachis fragile at the nodes; flattened; villous on margins. Rhachis internodes linear. Rhachis internode tip transverse. Spikelets in pairs. Fertile spikelets sessile; 1 in the cluster. Companion sterile spikelets pedicelled; 1 in the cluster. Pedicels linear; flattened; with a translucent median line (also present in internodes); villous. Companion sterile spikelets well-developed; containing empty lemmas, or male; lanceolate; 3.5-5 mm long; as long as fertile. Companion sterile spikelet glumes without depressions; glabrous. Companion sterile spikelet lemmas enclosed by glumes. Spikelets comprising 1 basal sterile florets; 1 fertile florets; without rhachilla extension. Spikelets lanceolate, or oblong; dorsally compressed; 3.5-5 mm long; falling entire; deciduous with accessory branch structures. Spikelet callus pilose; base obtuse; attached transversely. Companion sterile spikelets well-developed; containing empty lemmas, or male; lanceolate; 3.5-5 mm long; as long as fertile. Companion sterile spikelet glumes without depressions; glabrous. Companion sterile spikelet lemmas enclosed by glumes. Spikelets comprising 1 basal sterile florets; 1 fertile florets; without rhachilla extension. Spikelets lanceolate, or oblong; dorsally compressed; 3.5-5 mm long; falling entire; deciduous with accessory branch structures. Spikelet callus pilose; base obtuse; attached transversely. Glumes dissimilar; exceeding apex of florets; firmer than fertile lemma. Lower glume elliptic; 1 length of spikelet; chartaceous; without keels; keel-less except near apex. Lower glume surface flat; without pits; pilose; hairy below. Lower glume apex acute. Upper glume lanceolate; 1-keeled. Basal sterile florets barren; without significant palea. Lemma of lower sterile floret oblong; hyaline. Fertile lemma linear; hyaline; without keel. Lemma apex entire; awned; 1 -awned. Principal lemma awn apical; geniculate; 12-15 mm long overall; with twisted column. Column of lemma awn glabrous. Palea absent or minute. Europe: central, southwestern, southeastern, and eastern. Africa: north and Macaronesia. Asia-temperate: Siberia, Soviet Middle Asia, Caucasus, western Asia, China, and eastern Asia. Asia-tropical: India, Malesia, and Papuasia. Pacific: south-central. North America: north-central USA, south-central USA, southeast USA, and Mexico. South America: Caribbean, northern South America, and western South America. Naturalizada y adventicia en Colombia; Alt. 0 - 2000 m.; Andes, Llanura del Caribe. Nativa en Colombia; Alt. 2500 - 3500 m.; Andes. 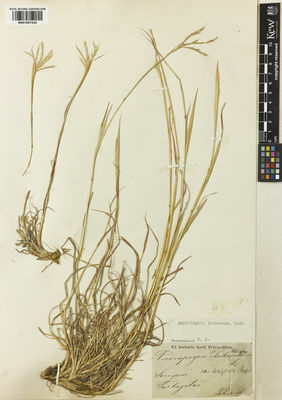 Bothriochloa ischaemum f. songarica (Rupr. ex Schrenk) Kitag. Verloove, Fl. & Reyes-Betancort, J.A. (2011). Additions to the flora of Tenerife (Canary islands, Spain) Collectanea Botanica 30: 63-78. Henty, E.E. (1969). A manual of the grasses of New Guinea: 1-215. Division of Botany, Dpt. of Forests, LAE, New Guinea. Pavlov, N.V. (ed.) (1956). Flora Kazakhstana 1: 1-354. Alma-Ata, Izd-vo Akademii nauk Kazakhskoi SSR. Guinea, E. (1948). Catálogo razonado de las plantas del Sáhara Español Anales del Jardin Botanico de Madrid 8: 357-429.